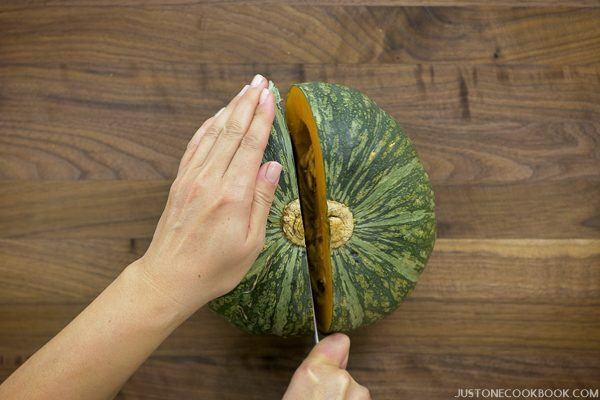 A complete guide on how to cut, peel, and cook a kabocha squash (Japanese pumpkin) with helpful tutorial video and step by step pictures. Over the years I’ve asked by my readers how I cut a whole kabocha squash (Japanese pumpkin) for my kabocha recipes. 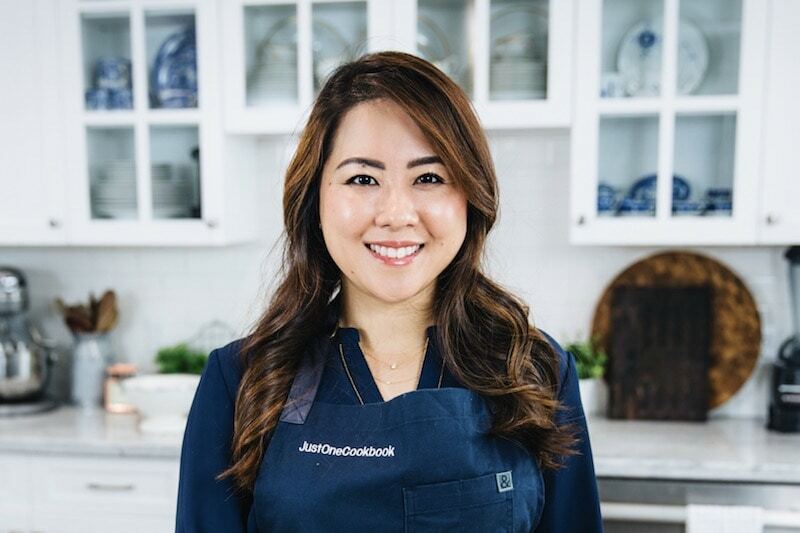 So today I am sharing a complete guide on how I cut a kabocha squash (including how to peel and cook kabocha), along with some of my favorite kabocha recipes. 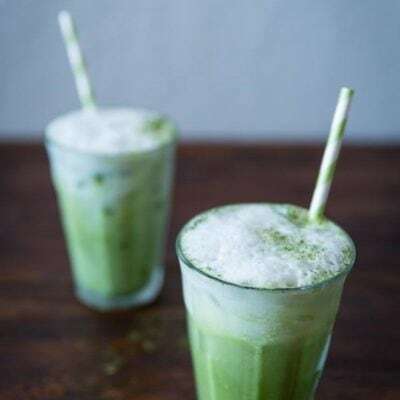 Kabocha squash, also known as Japanese pumpkin, has a thin but firm green skin and a bright vivid orange flesh. Amongst the many squash varieties, kabocha probably tastes the sweetest. Its rich texture and flavor is akin to a sweet potato and a pumpkin combined. 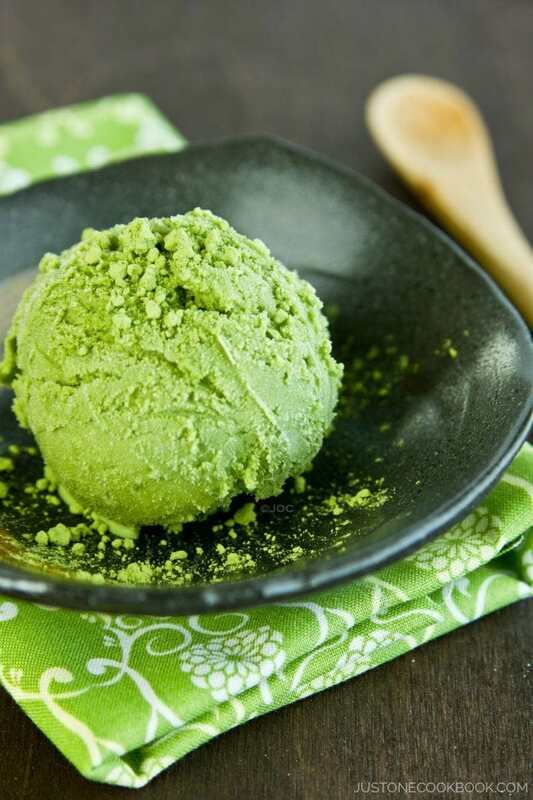 The green outer skin may look deceptively hard, but it is edible. Kabocha is used in many Japanese recipes where it is stewed, deep-fried into tempura, or even used in desserts. 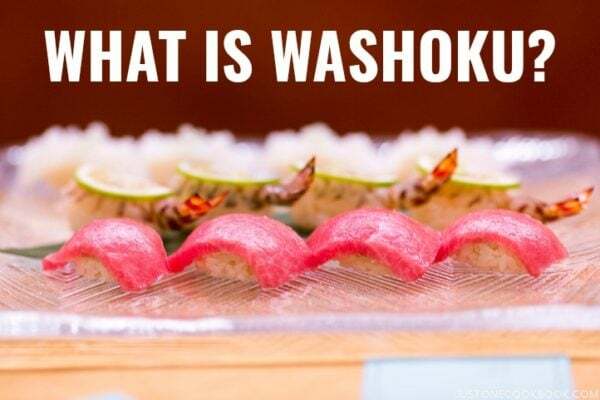 It has beta carotene, vitamins, and iron, and it’s one of those vegetables Japanese moms tell kids to eat it all up. Kabocha is grown year-round, but they are best in the late summer to late fall. 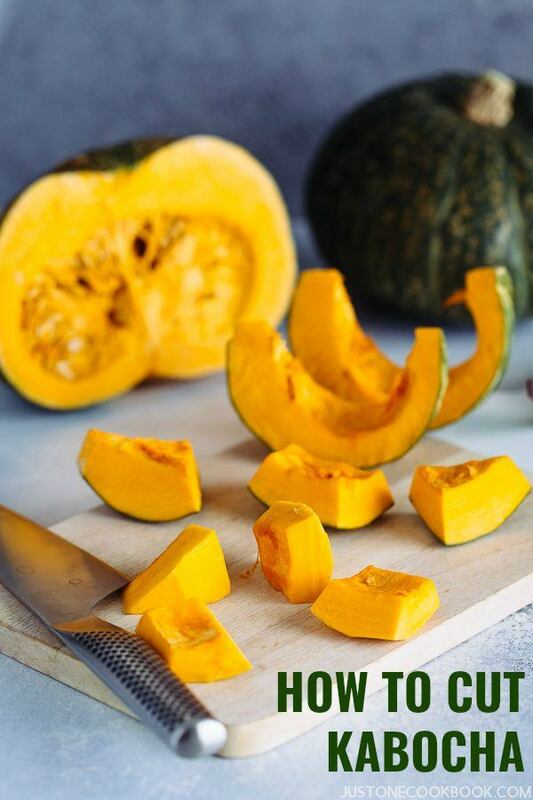 When picking out the perfect kabocha squash, the two most important factors to consider are color and weight. Choose kabocha that has a firm, deep-colored green rind. Some faint stripes, bumps, or blemishes on the skin are fine. And choose ones that feel heavy for their size (usually about 2-4 lbs). 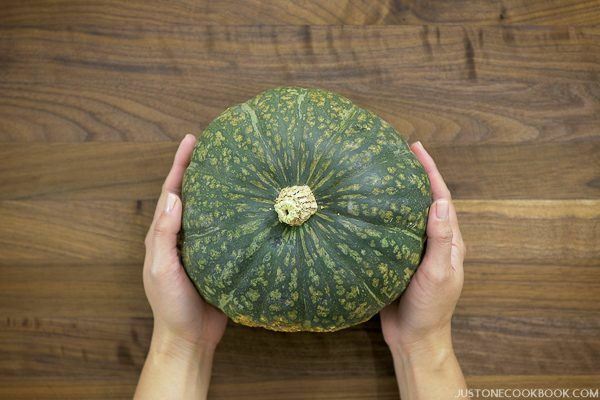 If you’re looking for a substitute for kabocha squash, you can use acorn or buttercup squash as they both have edible green skin and sweet orange flesh. 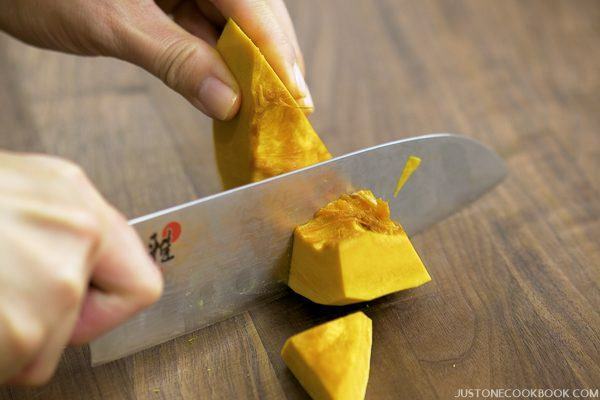 The most important tip to cut a kabocha squash is to get a large sharp knife. 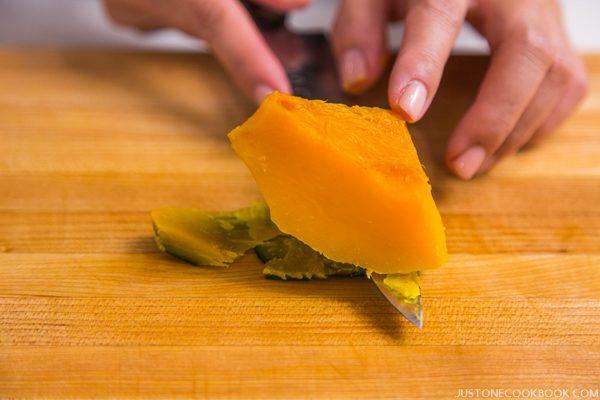 When you use a sharp knife, lesser force is required to make a cut of the squash. The edge of the knife bites the object precisely while a dull knife may slip and lose the control. That means a dull knife can be more dangerous than a sharp knife. 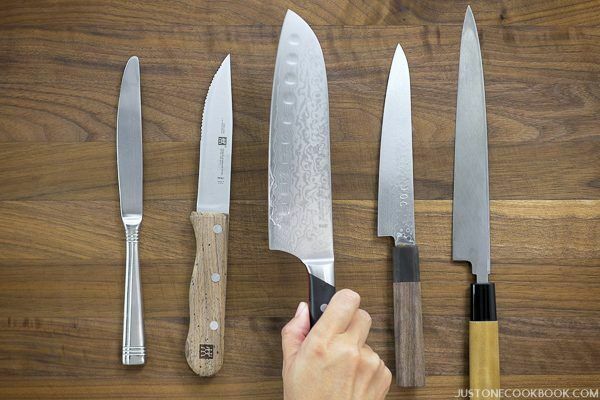 It’s always good to invest on one high quality, all-purpose chef knife (instead of buying a fancy set of knives). Now wash the kabocha squash and dry before moving onto the next step. 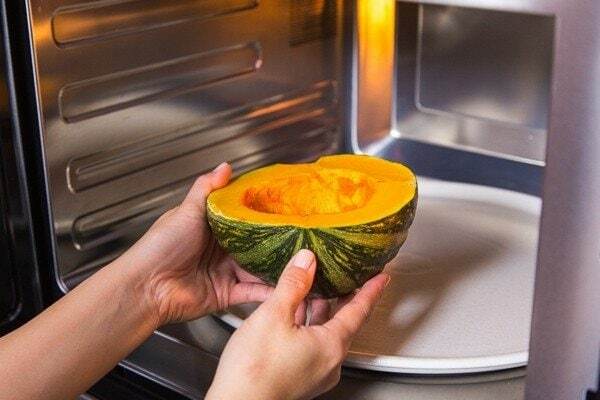 If you microwave half of kabocha, remove the seeds first. You might have already known this tip, but microwaving* a kabocha really helps. 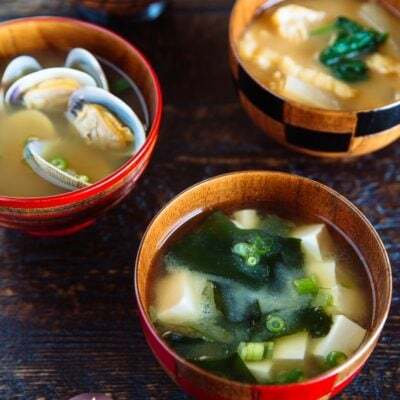 The microwave cooking time varies depending on the size of your kabocha, how soft you want your kabocha to be (some recipes require kabocha to be more raw than others), and your maximum microwave wattage. But it’s good to remember 2 to 4 minutes as your starting point. And if you’re like my son, you might be wondering if the kabocha squash would explode by microwaving. Let’s say it won’t happen unless you microwave it for like 10 minutes, which I’ve never done before. If you are curious to try, I can’t guarantee what would happen. Now if your kabocha is bigger than your microwave or you don’t own a microwave, you can either cut the whole kabocha with a large and heavy sharp knife, or you can wrap the kabocha in aluminum foil and bake in the oven at 400 ºF (200 ºC) for 15 minutes. *Disclaimer: Thanks to the commenter Lauren, we learned that a spark may come out from microwaving kabocha. I had never experienced this personally, but it’s good to know this could happen. 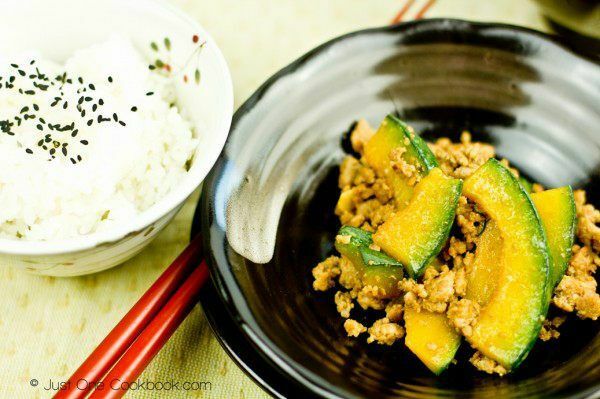 When you microwave, step aside to keep an eye on kabocha. Read this article if you are interested. 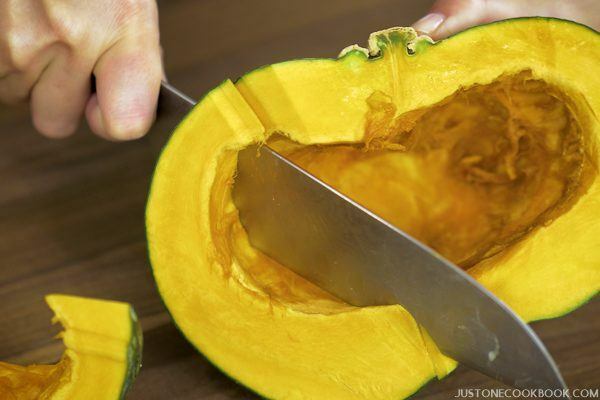 If you are slicing the whole kabocha, remove the stem first using a large spoon. Just dig in a little and it’ll pop out. Stick the very sharp knife in the middle and work around the outside until you can cut it into two parts. 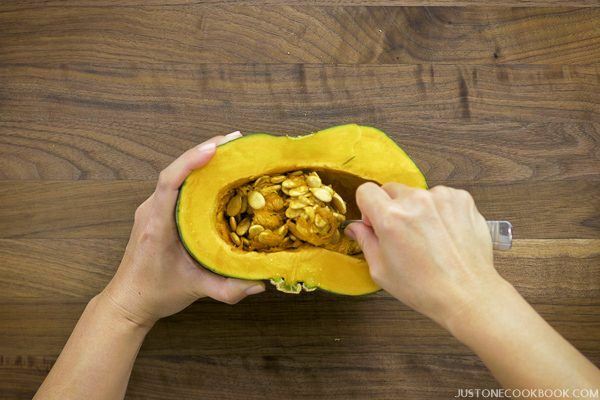 Using a large spoon, remove the seeds and pith from the core of the kabocha squash. Then slice the halves into 4-6 wedges depending on your recipe. You can also cut the halves in half first before slicing into smaller wedges. 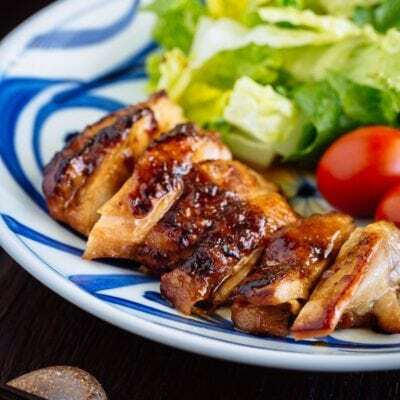 Depending on your recipe, you may need to cut the wedges into cubes or slices. 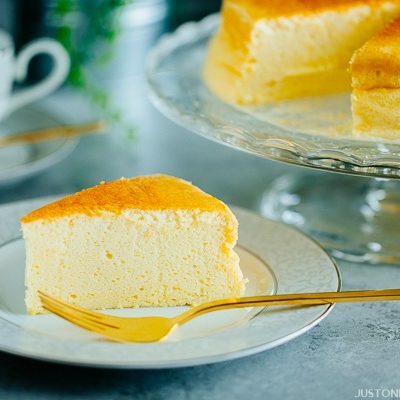 Decide if you want to remove the (edible) rind for your recipe. If you decide to remove it, read the next section before you cut into cubes or slices. The kabocha skin is edible. 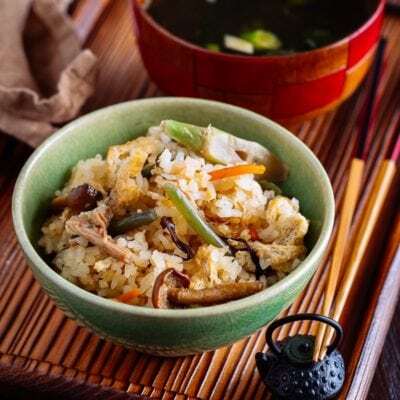 Many Japanese kabocha recipes such as kabocha tempura and simmered kabocha require to keep the skin on. 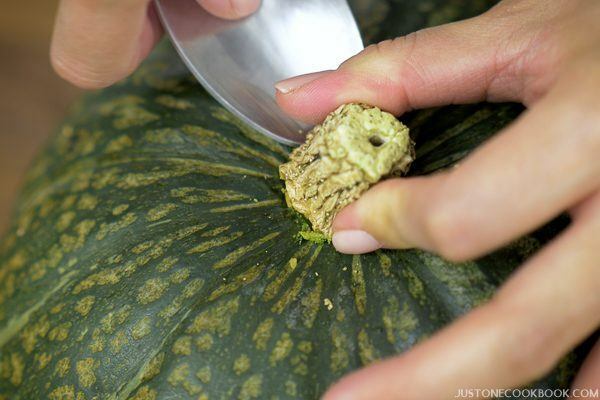 However, if you want to show that beautiful orange color in your recipe, you have to remove the rind as the dark green kabocha skin will not keep the beautiful orange flesh color. 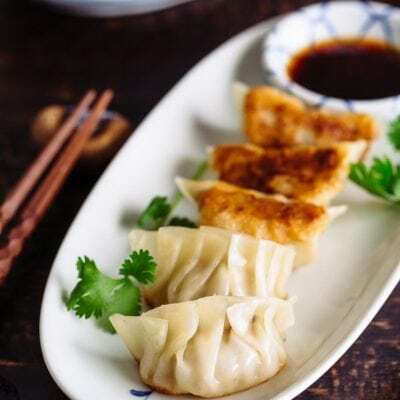 In most recipes, you will want to remove the skin first before cooking. Lay each wedge on its flat side, and slice the peel off. 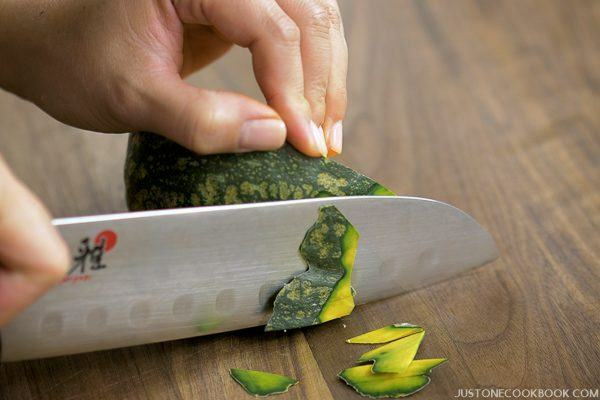 Then you can easily cut into small pieces. 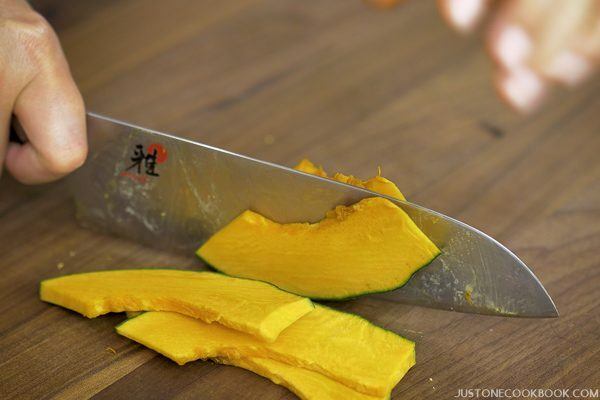 You will most likely use this method if you want to steam and puree the kabocha for your recipe. 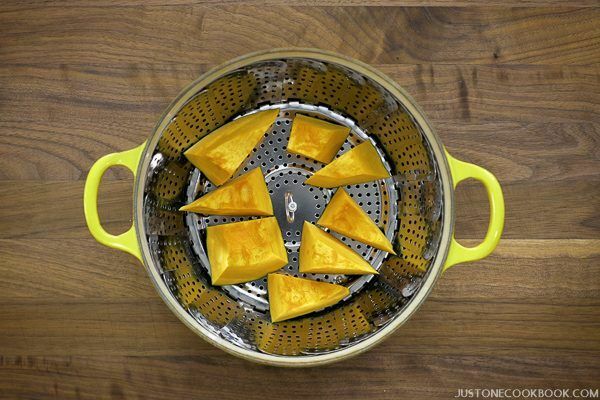 It’s best to keep the skin when steaming so that kabocha holds its shape and doesn’t stick to your steamer basket. If you are not using the entire kabocha squash, make sure to remove the seeds and pith from cut kabocha before wrapping with plastic wrap. 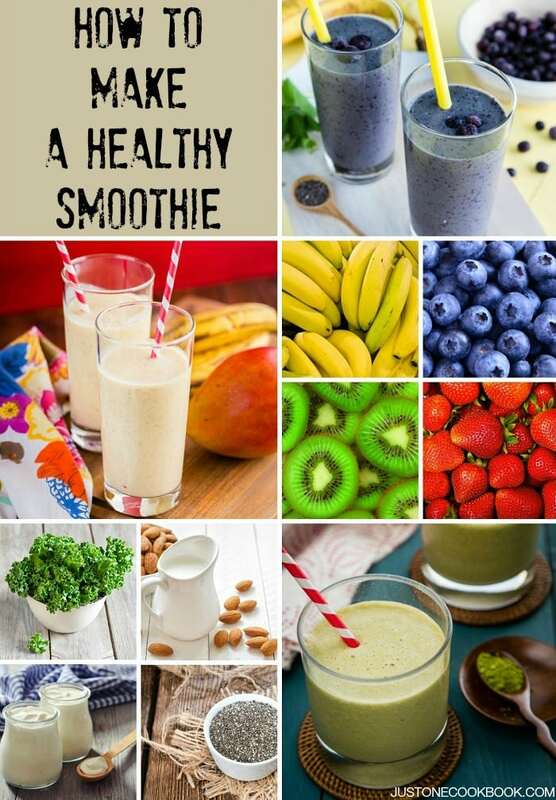 You can store in the refrigerator for 2-3 days or in the freezer for a month. 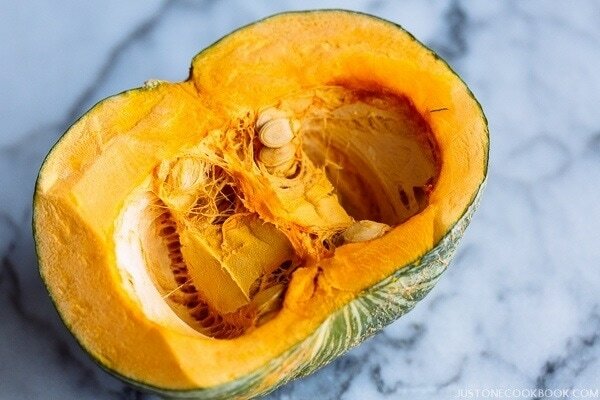 You can store the whole uncut kabocha in a cool, dry, dark place for up to 1-2 months. 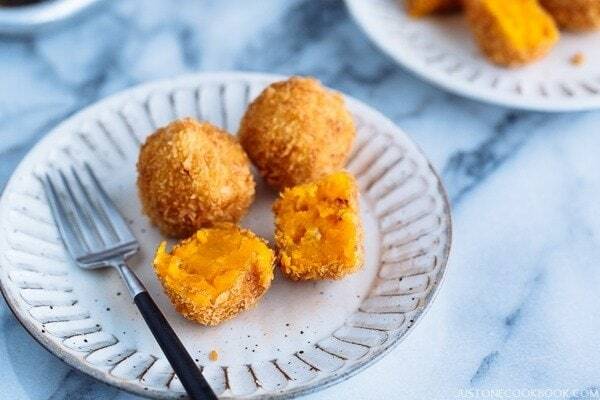 Steam diced kabocha squsash (with skin on), remove the rind, mash the flesh, and shape into this delicious Kabocha Croquettes (Japanese Pumpkin Korokke). 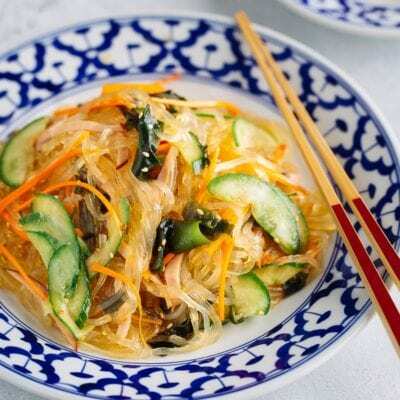 Boil peeled kabocha cubes and mash it to make this delicious Kabocha Salad. 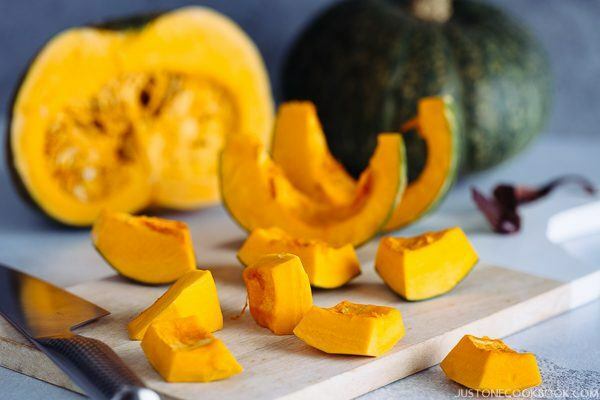 Throw steamed cubes into a food processor/blender to make Kabocha Squash Soup and Kabocha Squash Pie. 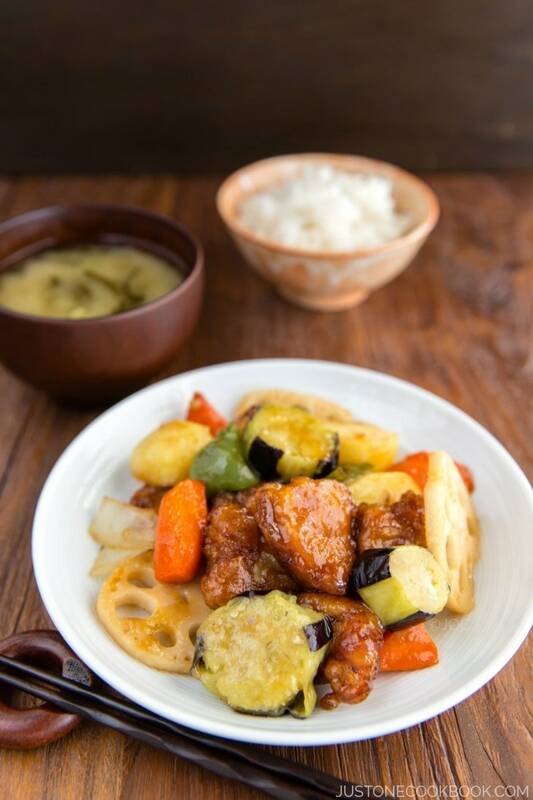 When simmered slowly in a delicious broth, curry, or stew, kabocha takes on a new depth of flavor. 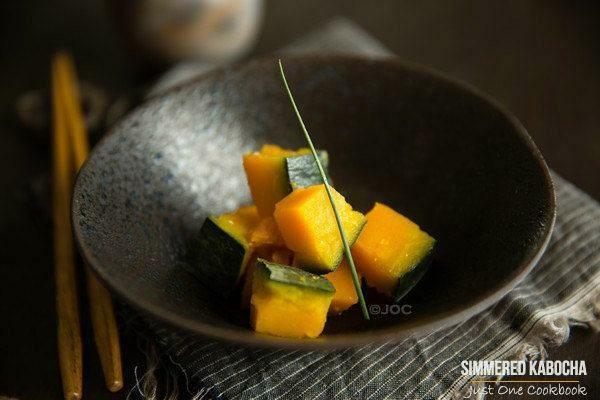 Check out traditional Japanese Simmered Kabocha made this way. When you’re stir frying kabocha, it’s best to keep the rind on so that kabocha slices keep in shape. 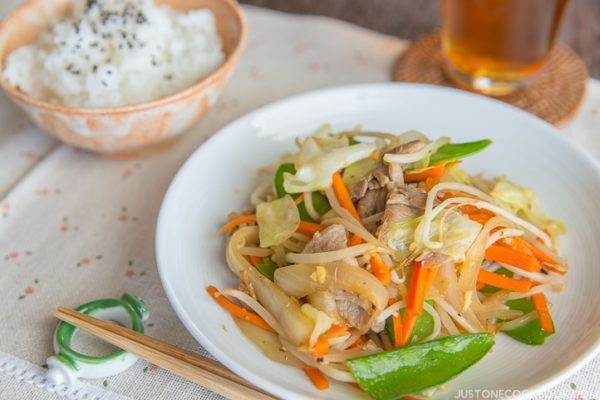 Make Kabocha Pork Stir Fry to go with your rice and miso soup. 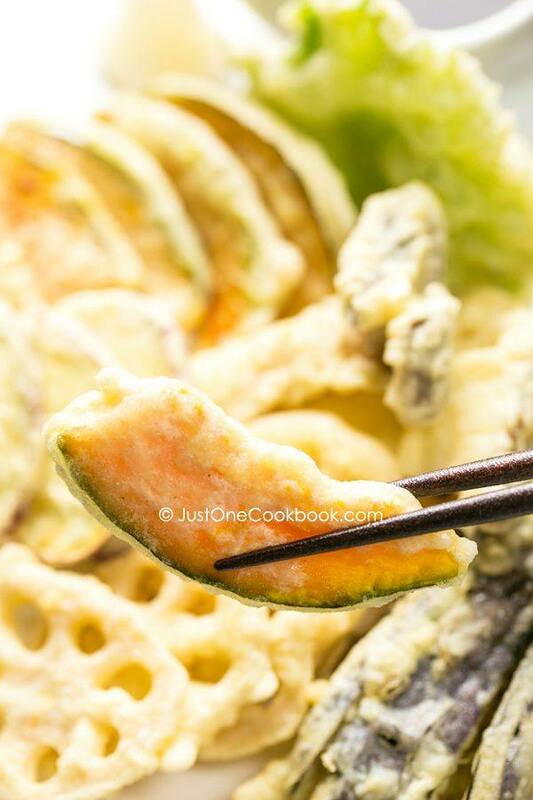 Dip your kabocha slices (with skin on) in tempura batter and deep fry to golden crisp kabocha tempura! 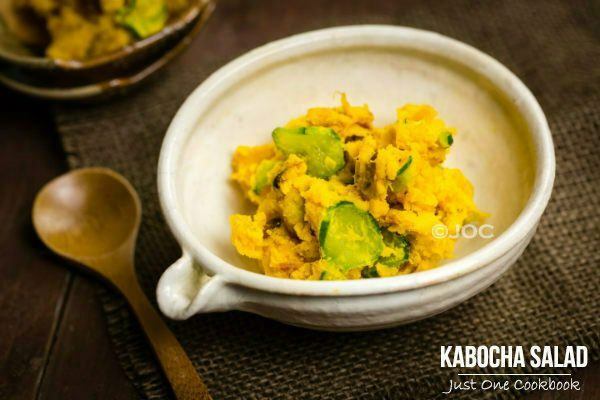 You can make your favorite casserole dishes with kabocha squash! Or toss kabocha squash with a drizzle of olive oil, salt, and pepper (or with your favorite spices and herbs) and let the oven does it work. 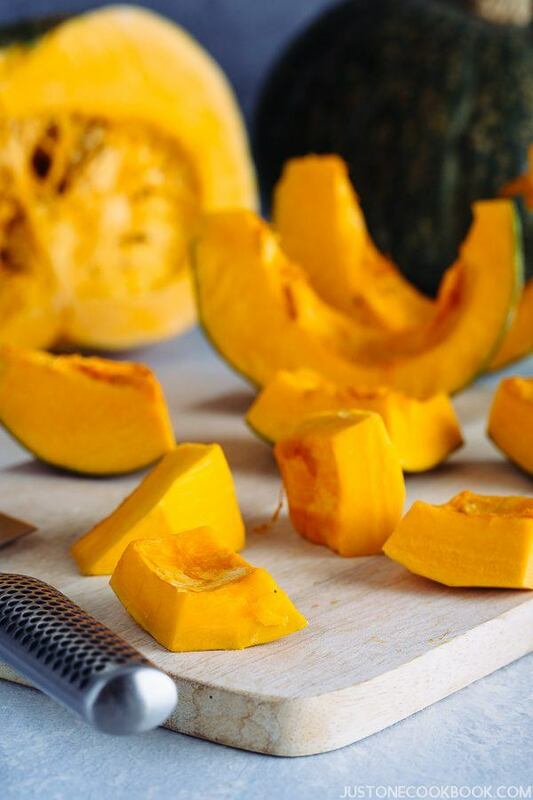 Roasting brings out the natural sweetness of kabocha beautifully. 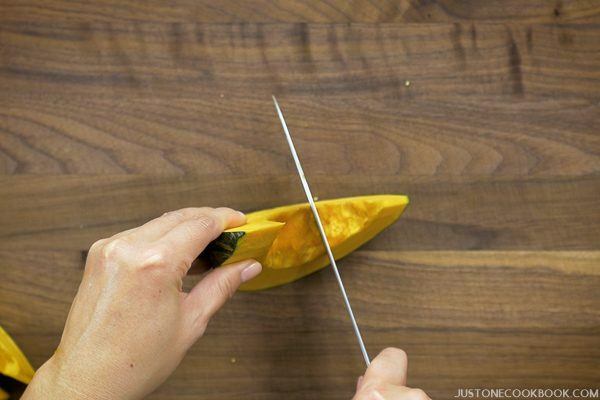 Did you enjoy learning How to Cut a Kabocha Squash? 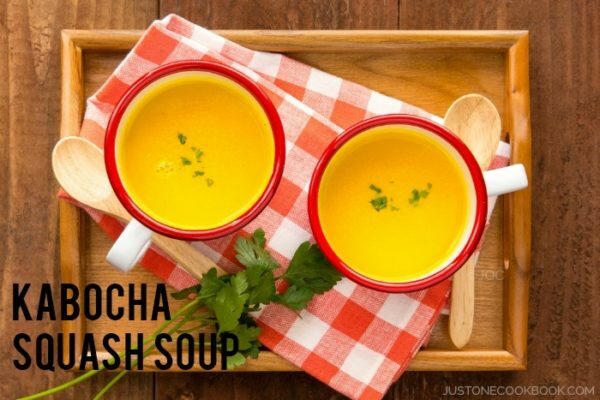 If you want to browse more kabocha recipes, click here. Thank you so much for reading and till next time! Can I also recommend a pumpkin knife? Those little, very serrated knives they sell in pumpkin carving kits are EXCELLENT for getting through tough vegetables…. they’re dull but have big serrations so you just saw away rather than using brute force, which lessens the chance of the knife slipping and cutting you. Thank you so much for your suggestion, Elizabeth! I learned a lot about kabocha squash. Thank you for a great post. Would you recommend that I freeze uncooked but prepped kabocha? Will it impact the textured once I thaw and cook? Love you blog and blogs! Great video and groovy music. I miss kabocha so much!!! Not back in the states yet, but super excited to see if I can find it somewhere! *smile* I have not seen Jap pumpkin here in the country but I use a lot of butternut, which we in Australia, also call pumpkin! And I do cut it up just the same: as long as the big knife is sharp and I am cutting on a secure board it seems to work. And, another smile, I do roughly the same things with it except deep frying as nothing ever, well, almost never, gets deep fried in my home !!! Making soup and steaming it are probably my two favourites!! The music to the video was a brilliant choice – it made cutting kabocha really exciting and dramatic!! Great idea to give us so many ways to prepare kabocha in one video. Thanks, Nami! Cut the squash in 1 to 2-inch wedges. Use your hands to smear melted coconut oil all over each wedge, including skin. Sprinkle very lightly with salt. Roast at 425 f. degrees until soft, 15 to 25 minutes, depending on size of wedges. 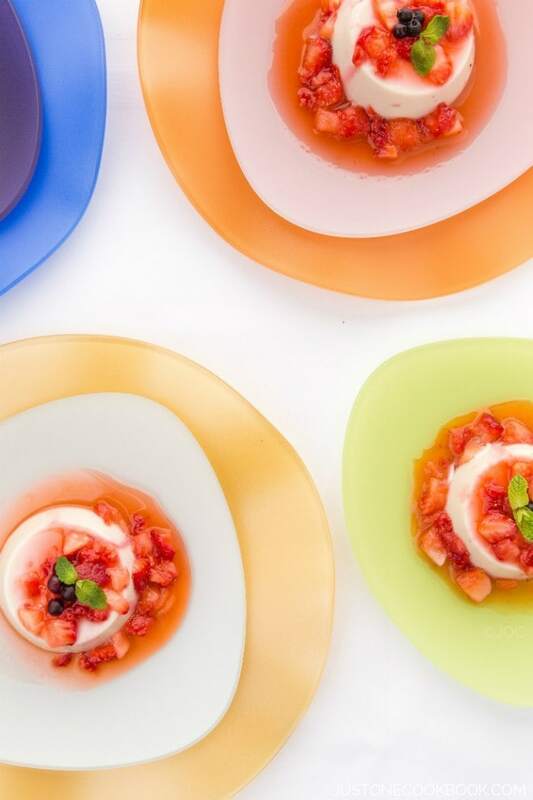 Serve warm or refrigerate for incredible snacks. Hi Mara! 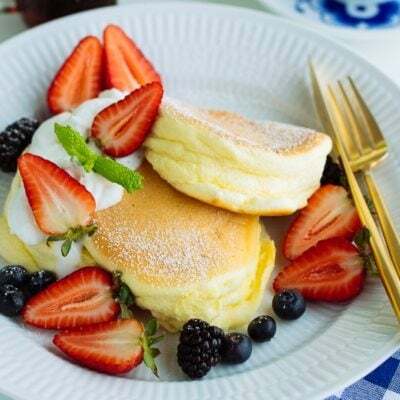 Thank you for sharing the delicious recipe with us! 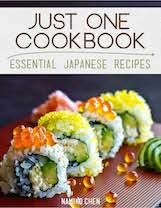 Thank you for sharing, I should have watched this before I made my kabocha soup a couple of nights ago! 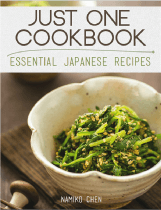 I had not cooked kabocha in a while and made a mess as well as getting a cut on my finger…. I just tried this and within about 15 second the kabocha was on fire in my microwave. Hi Lauren! Did you put ONLY bare kabocha? It’s hard to believe it gets on fire. No aluminum foil or anything in there right, just a whole or half kabocha? I put the entire kabocha squash with nothing else in the microwave. After a few seconds, a 2-3 inch flame was shooting out the top of the squash. Luckily it went away as soon as I opened the microwave door, but it was pretty scary. Hi Lauren! Thank you so much for letting me know! I googled and this “could” happen! Thanks to your feedback, I could put the disclaimer in my blog post. I have had microwave kabocha many times without this issue, but you tried it for the first time and got a spark in the microwave. This could happen to anyone! Thank you so much again, Lauren!